To illustrate this rally in bond prices, we plotted the average quarterly price return (ex-coupon) of bonds in the BEV universe in a matrix with country/region against credit ratings. As can be seen above, lower rated bonds performed relatively better in price terms than higher rated bonds in 1Q19. 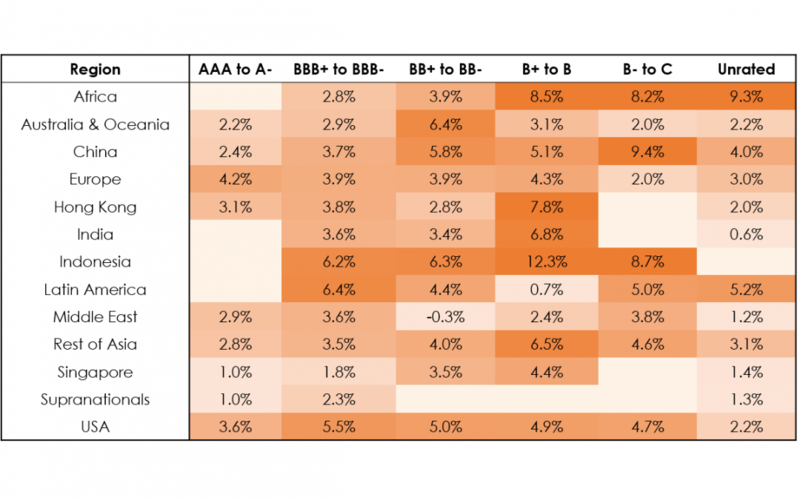 Further, bonds from emerging and frontier markets like Africa, India, Indonesia and Latin America performed relatively better than bonds from developed markets like Australia, Europe and Singapore. While the rally in the first two months of 2019 was largely attributable to tightening in credit spreads, the rally in March was primarily driven by a fall in benchmark yields. The yield on the 10-year US Treasury dropped by 31 basis points during March from 2.72% to 2.41%. This trend was evident in other global benchmarks as well, with the 10-year German bund and Japanese Government Bond (JGB) yields falling into negative territory for the first time since late 2016. Recession fears re-emerged amongst bond investors as the US Treasury yield curve inverted once again. An inversion in the Treasury yield curve has been a cause of panic as it has accurately predicted every US recession in the last 60 years. In the chart below, we have plotted spreads between the 5-year and 2-year (2s5s), 10-year and 2-year (2s10s), and 30-year and 2-year Treasury yields. During periods of economic growth, the yield curve tends to be upward sloping with the yield on longer tenor bonds higher than the yield on short tenor bills/notes, to compensate investors for inflation in the future. This can be justified by looking at periods of growth (2001-2005, 2009-2012, 2013-2015) in the above chart. Flight to safety coupled with subdued interest rate expectations tend to drive investors into longer tenor bonds (10-year), thus driving prices higher and yields lower. On the other hand, the short end of the curve is anchored by current monetary policy rather than inflation/growth expectations. This describes the current economic environment in the US, which spills over to the bond markets globally. 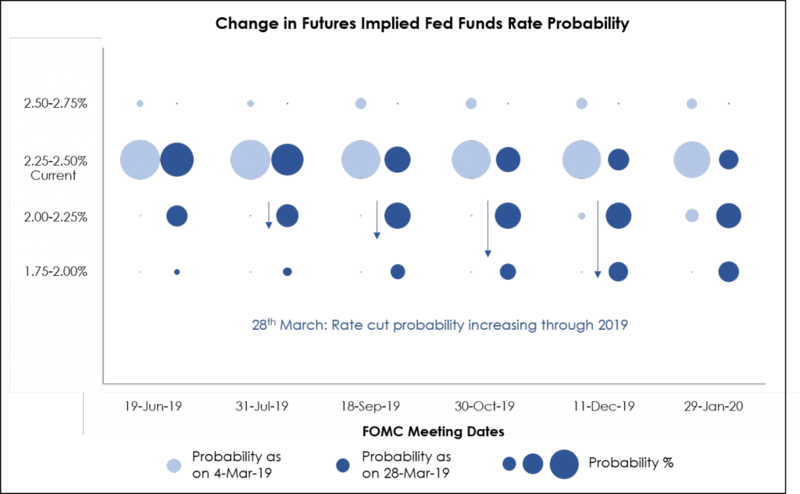 In the chart above, we have compared the Futures implied Fed Funds Rate probability between 4-Mar-19 (light blue bubbles) and 28-Mar-19 (dark blue bubbles). As can be seen, the probability of a rate cut increased significantly in just three weeks (between the two dates). This has been driven by the Fed commentary about pausing rate hikes. March was the month of redemption for Lippo Karawaci as it managed to secure $1 billion in funding via rights issue and asset divestment. The Indonesian real estate developer also had a change of guard, with John Riady as the new CEO and Surya Tatang as the new CFO. The fund infusion was well received by credit rating agencies with S&P placing Lippo’s CCC+ rating on review with ‘positive implications’ and Moody’s changing its outlook from ‘negative’ to ‘stable’, affirming its B3 rating. Yields on Lippo’s bonds dropped after the company announced a tender offer to buy-back up to $150 million of its bonds due 2022 and 2026. Bonds of HNA Group’s Hong Kong Airlines rallied on news of Cathay Pacific Airways acquiring low-cost carrier HK Express (part owned by HNA Group) for HK$ 4.93 billion or $628 million. 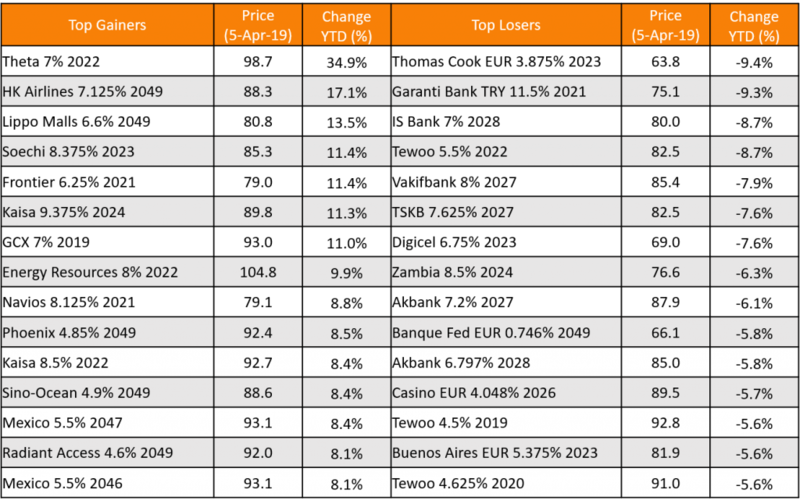 Turkish bonds were back in focus in the days leading up to elections on 31-Mar-19. Turkish banks were pressured not to provide liquidity to foreign investors who wanted to bet against the Turkish lira. This led the overnight cost of borrowing liras in the offshore swap market to soar beyond 1,000%. As a result, foreign investors dumped other Turkish assets, which led to a slide in Turkish bonds and stocks. 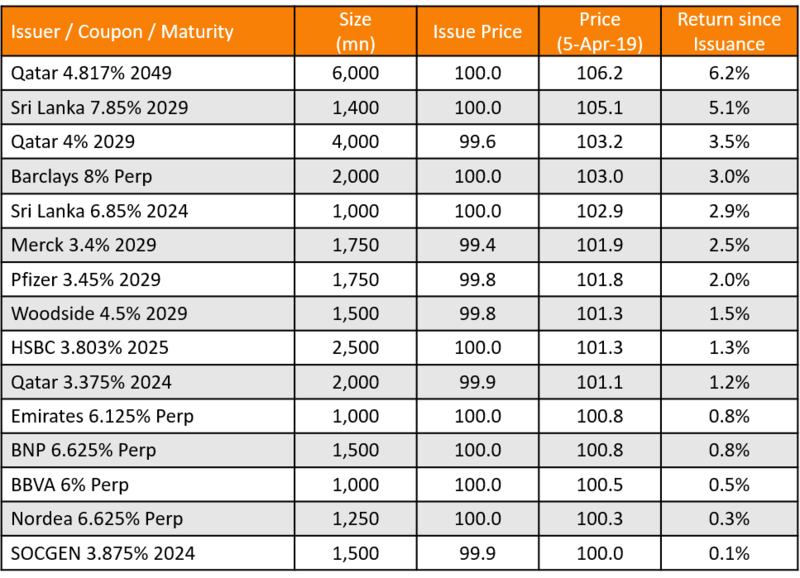 Issuance from high-yield and unrated issuers remained strong in the month of March, in line with January and February of 2019.